Desjeux Créations realizes the graphic design and the manufacturing of the DECORATION OF YOUR STAND through a furniture cardboard customizable 100%: table, chair, coat rack, hostess's counter, coat rack, totems. Do not hesitate to contact us for a custom-made PLV. 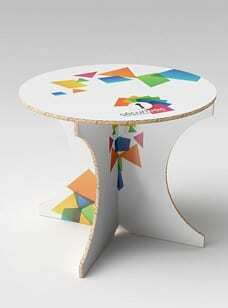 The alveolar cardboard table for a design in perfect harmony with your image during show. Lounges are often the opportunity to meet customers and prospects, and for it, it is necessary to be able of welcoming them in good conditions. The alveolar cardboard table is as practical as economic: of a very easy assembly, she is totally customizable (impression quadri 100% in your image - included foot) to be in perfect harmony with the design of the stand in the respect for your graphics standards. 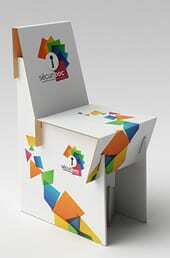 Cardboard chair for printing customizable to your image. Your company can equip itself on its stand of a VIP corner: as a supplement to the personalized cardboard table, the cardboard chairs will allow to create a comfortable and welcoming workspace, perfectly " charté " just like your company. The assembly is very fast, and the micro-splined cardboard offers an excellent resistance and one very good performance during all the duration of the show. Cardboard hostess'counter for your exibition show. In a path or directly on the exhibition stand, it is essential to be able to welcome the visitors to inform them or direct them quickly. The counter of alveolar cardboard reception settles down in a few minutes, without equipment. Totally customizable, it guarantees a big visibility in the flow of passage. We advise it for the points of information or casting of documentation. The small cunning detail … On shows, the visitors often have arms in charge of. When your commercial will welcome them on their stand for a business meeting, the alveolar cardboard coat rack will welcome bags, coats and accessories … A real very considerable mark of attention, and an intelligent way of avoiding the congestion of the stand! To present a range of products or to put forward a range of services, think of the column of multi-faces: of a very easy assembly, she allows to convey the strong messages which will be valued by the exceptional quality of impression. 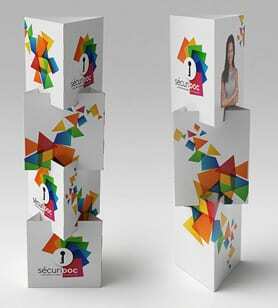 The column alveolar cardboard multi-faces creates of the relief on the stand, while serving as information medium for the commercial teams. Ideal for the promotions, the novelties or the big events. Exist in 3 or 4 modules..
Guide the visitor towards your stand by calling out him in the path with a cardboard silhouette in real size. 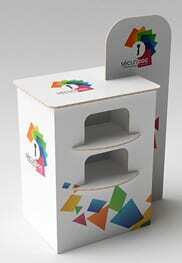 The cardboard totem cut in the shape is completed to direct or to draw the attention on a special offer. Small advice: the concept works even better with the photos of "truths" collaborators. An effect seizing in minimum price! The totem die-cut can also serve as PLV in store. Totem cardboard die-cut use: how, congrés, PLV, Open day..
Cardboard furniture technical informations: Print Quadri on dull coated paper or shine, against stuck on brown Kraft internal alveolar cardboard (thickness 16 mm) - Delivered with a kit of binding: 2 screws and 2 bindings butterfly - very resistant recyclable cardboard. We can also value your image during your appearance thanks to our factual communications tools: stand exposition, comptoir d'hôtesse, kakemono, roller banner, mediacube, winflag, logo et lettre 3D, toile grand format. Share the post "Cardboard Furniture"